Are you researching employee timekeeping apps? Did you know that you can do a product walkthrough right now? 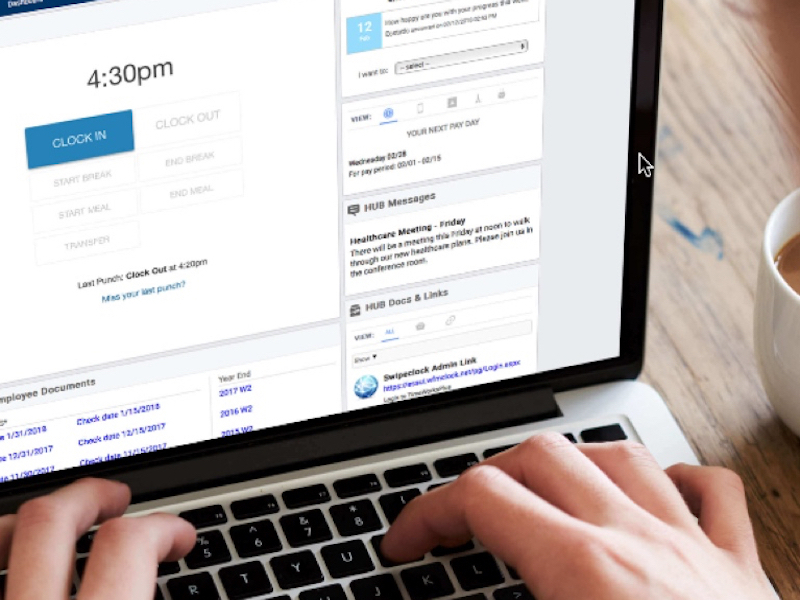 TimeWorksPlus is an intuitive time and attendance system from SwipeClock. It provides employee self-service for punch-ins, time cards, time off requests. And much more. When you start the TimeWorksPlus walkthrough, you will see the welcome screen displayed as if on a mobile phone. When you use a mouse/cursor or touchscreen to click on the buttons, the demo responds just as if you were using the actual app. Go ahead, try it! You’re at the walkthrough now, aren’t you? Good. Let’s start. We’ll go through the TimeWorksPlus demo as if you were an employee using it in real life. You are greeted by a LOGIN screen. To access the employee portal, you enter your employee ID and password. Your employer can add a site ID if they have more than one location or want to identify multiple job sites. Go ahead and login. Now you are greeted by the CLOCK IN screen. The current time is displayed in large font at the top of the screen. Underneath that, there are options for CLOCK IN and CLOCK OUT. Further down, there are buttons for starting and ending breaks and meals. Moving lower, you will see your last punch, both the date and time. If you missed your last punch, click the MISSED YOUR LAST PUNCH button. Another clock in screen will appear. Go ahead. Clock in. A green confirmation will appear verifying that your punch was recorded. The navigation bar on the bottom shows you that you are in the DASHBOARD section of the TimeWorksPlus time and attendance app. Notice that not all the options are enabled. If you have already punched in, you can’t punch in again. If you already clocked out for a break, you need to end your break before doing anything else. This ‘intelligent clock’ prevents missed punches by only presenting logical choices for the situation. This is an area where TimeWorksPlus is definitely ahead of the curve. Let’s check out the time card section. Click the second button on the navigation bar at the bottom of the screen. The blue bar at the top displays the start and end of the pay period. You can click the left arrow to see an earlier time card. You can click the right arrow to view more recent time cards. On the left, the time card lists the date. On the right, it lists the hours and minutes worked for each date. Simple and beautiful. At the top, it displays the total for the pay period. Let’s explore the employee schedule section. Click on the SCHEDULE icon on the navigation bar. A calendar will appear at the top of the screen. The days you are scheduled are highlighted. This gives you a quick view at-a-glance. Underneath the month calendar, each specific shift is listed. All the important info is there: date, shift start and end time, and, if applicable, department or job role. Directly underneath the calendar is a button that says ‘Go to TimeSimplicity.’ SwipeClock has another walkthrough for TimeSimplicity, the employee scheduling app. Another important function is time off requests. You get to the Time Off Request screen by clicking on the TIME OFF button on the lower navigation bar. This page is just as easy to use as the others. In the top section, you select the dates you want to request. Under that, you enter the type of leave (if applicable). Below that is a dropdown menu for number of hours per day. The shaded blue box will keep a tally of the total time off hours requested as you add them. How Does TimeWorksPlus Help Your Business? Put your payroll on the express train. TimeWorksPlus integrates with all major payroll systems. Import TimeWorksPlus employee hours into your payroll processing platform. Eliminate manual data entry. Free up several hours a week with fast time card approvals. TimeWorksPlus allows your employees to clock in with online or physical time clocks. It captures punch times and compiles time cards as the pay period progresses. Automation eliminates human error that renders hours data inaccurate. The TimeWorksPlus timekeeping app also tracks meals, breaks, accruals, and overtime. TimeWorksPlus has loads of tools to enforce schedules. Prevent early punch in or late punch out. Stop paying employees for unpaid meal periods. The mobile timekeeping app tracks offsite employees with GPS. You will know when and where remote employees clock in and out. Pair TimeWorksPlus with a biometric time clock and prevent buddy clocking. TimeWorksPlus helps you comply with Federal and State wage and hour laws. These include overtime, minimum wage, fair scheduling, and full-time/part-time status for the Affordable Care Act. It’s designed for full compliance with Fair Labor Standards Act (FLSA) recordkeeping requirements. Run reports for the express purpose of defending your company in case of an audit. When you combine the benefits described previously, you are able to significantly lower your labor costs. You won’t pay employees for time not working. You will be able to limit overtime. Your HR team won’t need as much time to process payroll. Your labor costs won’t be unnecessarily inflated by time card inaccuracies. And you won’t pay costly fines for noncompliance. TimeWorksPlus is designed for small to mid-size businesses with hourly employees. But many of our clients use it for salaried employees as well. It works great for job tracking, project planning, and labor allocation. It has tools designed for retail, hospitality, food and beverage, manufacturing, and construction. Visit TimeWorksPlus for more information on ahead-of-the-curve features specific to your industry.